Today I'm taking a moment to go through some of my inventory I think deserves a second chance to be highlighted on the blog. 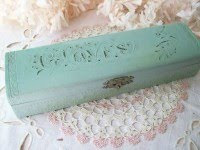 This aqua colored box with the writing "GLOVES" on the lid is so pretty and is my selection for this week. While gloves may be out of fashion right now, it is never out of fashion to use vintage items for storage or for display. This beauty still has lots of life left... and for Second Chance Tuesday, I am taking 20 percent off...click here to go there now. My latest finds are ready for their "photo shoot." Hopefully I can carve out some time in between Mommy duty and someone's nap time. Look for new listings in the next day or so! It's absolutely gorgeous.... and I just love the color!!! Thanks, Daphne, I agree! If I had my way, it would all end up in a very girly, foofy looking guest room. But, no such room exists, so I sell it all instead. Be glad of naptime! I was horrified when both K & N outgrew it in its entirety at the age of two. It ground me to a halt having to entertain them for 13 to 14 consecutive hours! Wow! That is a fabulous box. Never have seen anything like it. Wish my little one would take naps. I'm afraid he's grown out of it now. I always wanted to take a nap when he did so I probably wouldn't accomplish much even if he did! 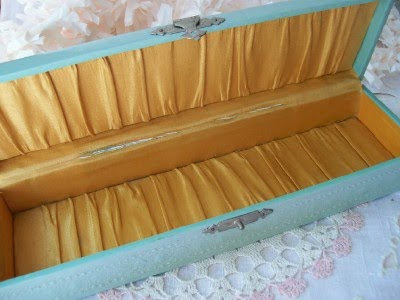 That is a lovely glove box and that color turquoise is one of my favorites. Good choice for Second Chance Tuesday. Fleamarket Shopping ~ New Listings Tonight?